Get the online training on Memory Corruption Issues now! Riscure releases the fifth online security training, focused on Memory Corruption Issues in C programming. Free sample is available to try this course before you make a purchase. 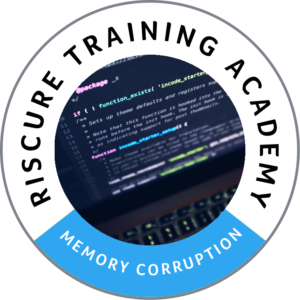 Riscure releases its latest online training course, focused on Memory Corruption Issues in C programming. This course provides a thorough guide to memory corruption issues. During the course you will learn about arbitrary writes, the most severe type of memory corruption vulnerabilities, the classic buffer overflows and the subtle off-by-one vulnerability. We discuss the culprits for introducing memory corruption and techniques to systematically discover vulnerabilities. In the final section, we close with coding best practices. This course is available for attendees at any time and they can go through its chapters at a comfortable pace. A free sample allows you to try this course before you make a purchase. Unlike our previous online trainings on Side Channel Analysis and Fault Injection, this is the first in the series of courses to cover the essential security issues of modern software. Still focused on embedded systems, it offers you the insights collected by our team of experts while evaluating the hardware and software of hundreds of connected devices. The free sample of this course is available here. You can register and pay for this course via our e-learning system here.